I met Daddy Tim at approximately 5:30am while a mutual friend and I were getting ready to exercise (yes, we rock out a 5:45am class religiously 2x/week). He was all sweaty from his own workout and proceeded to shake my hand anyways which makes it sound gross, but it was actually quite endearing! Daddy Tim and Mama Hadley are the kind of people who are so down-to-earth, you feel like part of the family the moment you meet them. They are kind, sweet, open people who know how to laugh at life...I knew we'd get along great! When their family of three became a family of four by adding Gus, I was elated to capture them at home with their new addition. Big Sister Lucy was proud and sweet, even allowing us to capture several shots of her and Gus together - truly a GIFT if you've ever worked with toddlers! 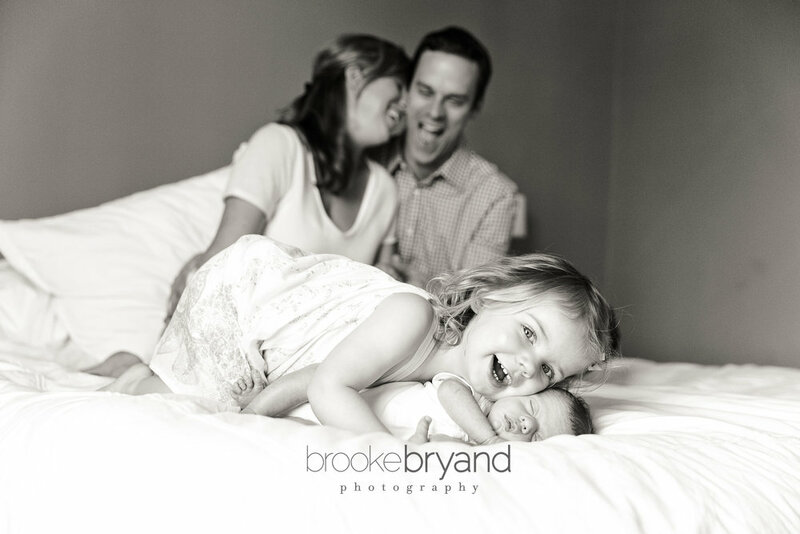 Here are some of my favorites from our lifestyle newborn session in their home, starting with my FAVORITE family photo of them - it's so them!.